Smudging footprints in the sand with your wedding train and having your veil carried by the sea breeze make beach weddings the stuff of daydreams. Cyprus is fast becoming the destination of choice for overseas nuptials. For summer 2019 we have added Cyprus to our list of wedding destinations flying direct from Dublin. 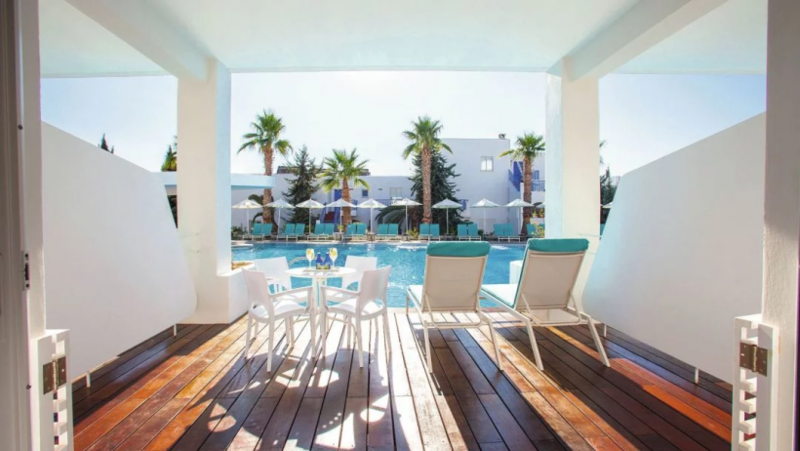 There is a wide range of hotels and resorts on offer where couples can say “I Do” including the adults-only Sensimar range and the 5* TUI Sensatori Resort Atlantica Aphrodite Hills as well as the family-friendly Holiday Village Aliathon to name a few. Ceremonies can take place in town halls sandwiched between bursts of pink bougainvillea, by the pool or in beautiful beachside hotel gardens that overlook the sea. Cyprus has been a love nest for centuries, according to legend, the island is the birthplace of the Goddess of Love, Aphrodite. It’s thought the immortal temptress enjoyed secret forest rendezvous here with a string of ancient gods, like Ares and Adonis. Fast forward a bit, and the Roman general, Mark Antony, is said to have presented the island to Cleopatra as a token of his love and affection. Today this beautiful island still spells romance. With an 800-kilometre-long coastline, sandy beaches & pine forests straight from a fairytale it’s easy to see why couples choose Cyprus as their wedding destination of choice. On the days the couple are not tying the knot they can spend time exploring the Cypriot countryside. Nights are also made for outings à deux, with spots like Limassol specialising in lantern-lit tables, light jazz and sea views. 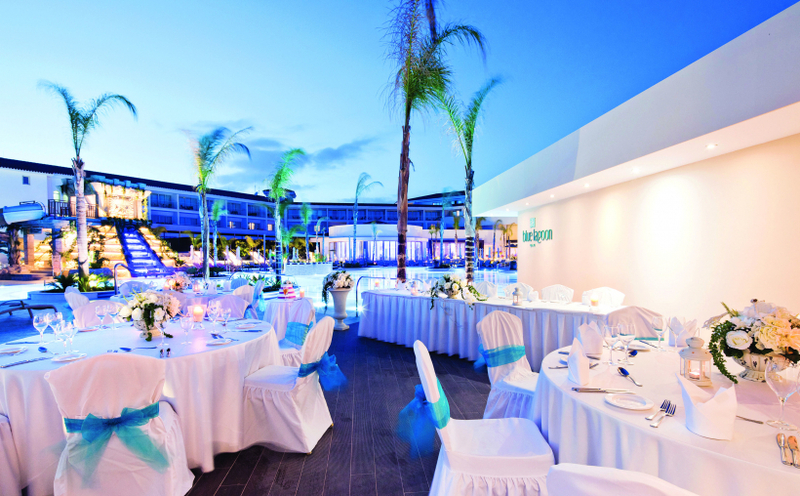 Take a look at some of our hotels in Paphos offering wedding ceremonies below. This luxury hotel is set in tropical gardens next to a Blue Flag beach. 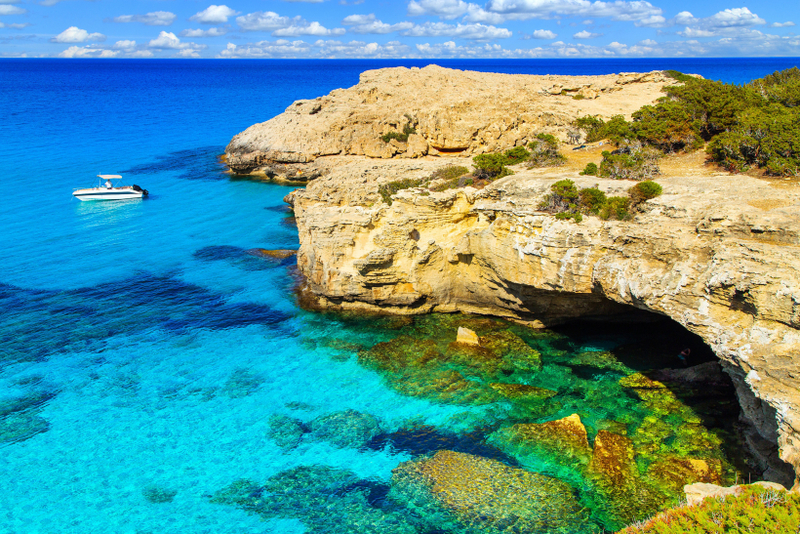 It’s only a 5-minute drive from the centre of Paphos, too. The wedding venues here consist of the stunning Olympian Sunset venue overlooking the sea for the ceremony and then a choice of Blue Lagoon Gardens, Captain’s Deck, Blue Lagoon Pool Bar and Seven Orchids restaurant for the reception. All venues are set in quiet locations and overlook the beautiful landscape of the hotel gardens and the sea. 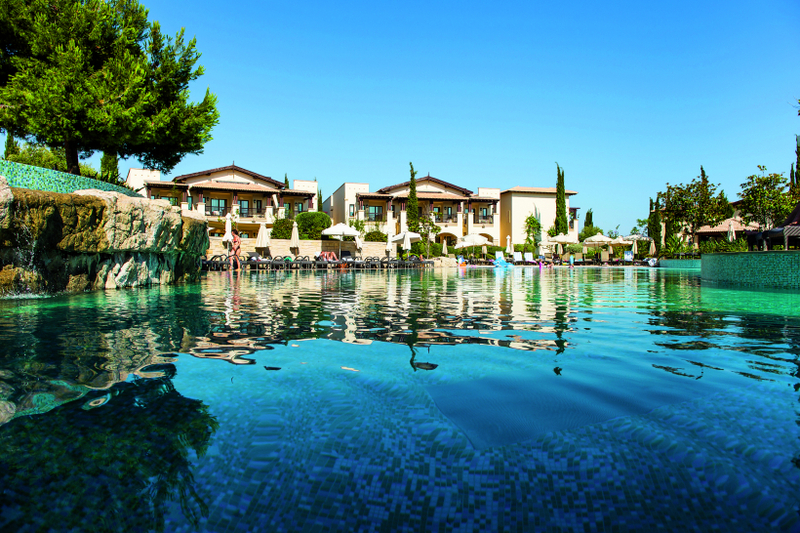 Just a stone’s throw from the Mediterranean sea, situated in a hill-top position offering panoramic views, the new TUI SENSATORI Resort Aphrodite Hills pairs an award-winning spa with a great choice of restaurants and a championship golf-course. Ceremonies take place here beside the beach. The resort also features a sea-view cocktail lounge. This beachfront complex looks more like a mini village than a hotel with sugarcube apartments surrounded by landscaped gardens, with a large pool in the heart of it all. Couple shave the choice of saying ‘I do’ in a traditional chapel or under a beachfront marquee & wedding guests can enjoy an Al fresco dining experience. 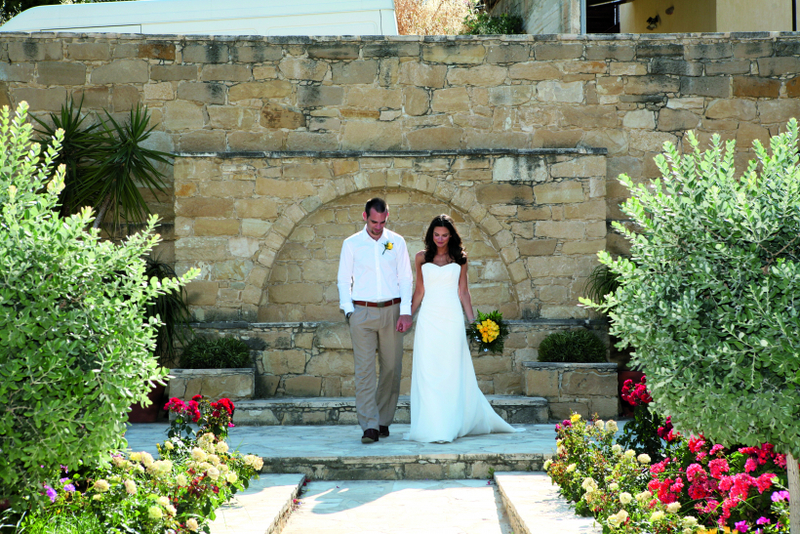 Weddings take place in the pretty landscaped gardens, or at the hotel’s traditional chapel. Couples can also enjoy a number of wedding-specific perks like a candlelit dinner for two and breakfast in bed the morning after their wedding. As for before and after the wedding, there’s lot to keep adult & young guests entertained. For starters, there’s the huge lagoon-style pool, as well as sports and activities on tap. There are a number of different wedding ceremony packages on offer to suit the super chic bride looking for the utmost luxury to the more budget conscious bride looking for something small & intimate or those with young families who want a wedding day in a family-friendly resort. Our destination wedding packages in Cyprus offer excellent value with some hotels offering wedding packages from as little as €779. Many of the basic packages include a decoration set-up for the ceremony, registrar fees, a delicious wedding cake, two glasses of sparkling wine, bridal bouquet, recorded music/CD for the ceremony, matching groom boutonniere, a semi-private candlelit dinner for two and, of course, the all-important marriage certificate. Our dedicated team of overseas wedding experts can assist in venue planning, accommodation, photographers, make-up artists and bands. Search our holiday deals to Cyprus here or to find out more about our Cyprus wedding programme ask in-store or call the TUI wedding team on 1850 946 164.